There are a ton of coffee delivery services out there these days, and it's harder and harder for new cats to distinguish themselves from the pride. Some companies market themselves as having an extensive variety of roasters and beans new each month, while others trumpet their staunch consistency to the same beans forever. A handful of folks focus solely on gorgeous, effective branding; some champion the coffee quality above all; and a precious few do both well. In general, no matter the approach it seems that whatever your style, there's a coffee subscription for you. One of the newer subscription outfits to meet my gaze is Coffee Boys, a trio of three coffee aficionados that offer three coffee profiles to their fans: light, balanced and bold. With 16 ounce bags starting at $29.00/month (with free shipping), they claim to provide the best coffee possible. 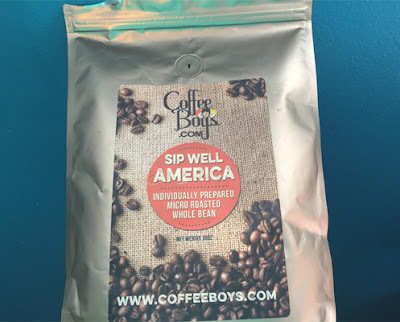 Curious, I decided to test the claim and try out a bag of Coffee Boys' coffee through several infusions via pourover, french press and siphon. The mystery coffee arrived (oddly no name of the single origin appeared on the bag) and I didn't lose any time in getting started. The pourover resonated notes of milk chocolate, pretzel, apples, cloves and light cherry in a medium body, making for a thick, sweet brew. The french press demonstrated notes of chocolate pretzel, 2% milk, cherry, apple and a little romaine, proving a little smoother. The siphon rounded out on a pleasant note, with flavors of chocolate pretzel, milk, romaine and apple in a medium body. All together the coffee did prove fairly tasty, though still not free of some detraction (a little too much of the pretzel and clove), and hence not really a coffee I can christen as "the best." I would also add that I did not like the mystery when it came to the coffee, as I like to know what I am drinking beyond a general profile (and of that, I am 99% sure I got "light", but again there was nothing on the bag). Lastly, while there was free shipping, $29.00/lb seemed a tad high for an unknown single origin. With all of that said, as I did mention earlier, there are many niches. Thus, if this all resonates as an experience you're seeking, check out Coffee Boys on their website to sign up.